Helps to minimize the physical or cognitive disability. Assist the people affected by injuries or any other kind of illness. Particularly effective for older adults suffering from stroke, joint replacement surgery or any other injuries. Are you participating in the awareness events for the rehabilitation week? Customized Wristbands are the popular fundraiser to help promote rehabilitation awareness and increase participation in the events. Show your support by customizing your wristbands with any message related to your event. Messages for your bracelets can be generic, such as “Rehabilitation Week - September” or, you may want to get innovative with a message such as “Join with me for awareness” or “Ask me about my bands”. Many people participate in such events to show support, and wristbands are considered more personal for that purpose. Rehab professionals must be rewarded for their dedication towards patients. Instead of choosing from a wide selection of personalized gifts it is a better option to go for the wristbands, which are both trendy as well as cost-effective. 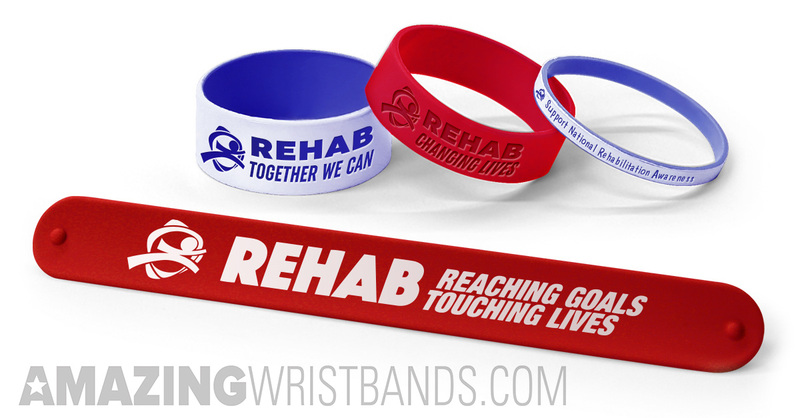 Reasons to Buy Rehabilitation Awareness Bracelets from Us? We (amazingWristbands.com) are the leading provider of customized silicone wristbands and rings available online. Our silicone products are comfortable, durable, and non-allergenic. Most importantly, we offer high-quality bands with a variety of styles. Most famous styles included Debossed, Ink filled debossed, embossed, colorized emboss and screen printed, besides that we also have a dual layer style, which has two different layers. The main color will be on the outside layer of the band and the secondary color will be on the inside layer of the band. The outside color will be laser debossed based on the message you choose. For example, if you are choosing the Yellow/Blue dual layer style your band will be in yellow color with the blue message along with the inside layer as blue. Wide variety of message types and awareness colors are also available to help your wristbands stand out and make a difference. In addition to the standard size bands, we also offer ¼”, ¾” and 1” bands. If you are not sure about your wrist size, we have specially designed adjustable snap and slap bands which give a perfect fit for any size. LED, Medallions and USB bands are our latest inclusion. Delivery within 24 to 72 hours for selected products and a minimum of 5 - 10-day production for the other products you choose. Get a detailed quote for your rehabilitation awareness wristbands in minutes using our online design tool or contact our professional and friendly customer service agents through 1-800-269-0910, to get an idea about the bands you are looking for. Also, you can email us at customercare@amazingwristbands.com. Spread awareness and show your support for the event as much as you can.